Dr. Ramesh is a Professor of Neurology at Harvard Medical School and an Associate Neurologist at MGH. 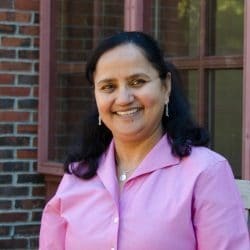 She obtained her Ph.D. from University of Madras, India and completed postdoctoral training in the laboratories of James Gusella (MGH) and Dr. Vivian Shih (MGH). 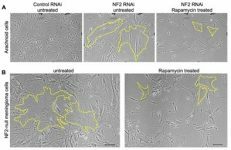 Her laboratory works on NF2 and TSC, employing disease-relevant human cellular models to discover pathways and mechanisms of pathophysiology and using the results to identify single and combination drug treatment, which could be translated into the clinic. What are the kinases and other druggable targets abnormally regulated in NF2-deficient meningiomas and schwannomas? 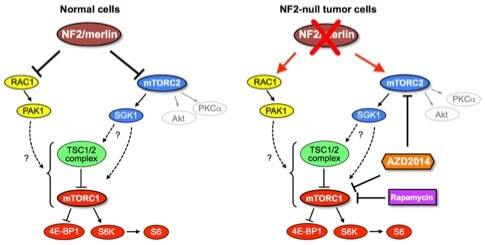 Is there crosstalk between mTOR signaling and other pathways aberrantly activated in NF2-deficient tumor cells? 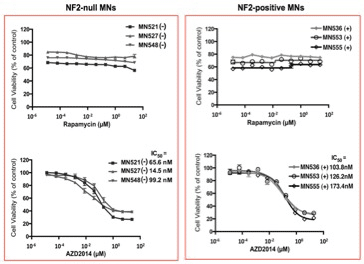 Is dual mTORC1/mTORC2 inhibitor AZD2014 more effective than rapamycin for treating patients with NF2-associated and sporadic meningiomas? Can we better understand the pathophysiology of the multisystem disorder TSC through use of patient-derived iPSCs? Bi-allelic inactivating mutations in the NF2 tumor suppressor gene leads to CNS tumors such as schwannomas and meningiomas in NF2 patients and in a majority of sporadic cases. Our studies employing NF2/sporadic patient-derived tumor cells established that the NF2 protein (NF2/merlin) plays a role in mTOR signaling (James et al., Mol. Cell. Biol. 2009; James et al., Mol. Can. Res. 2012; Beauchamp et al., Oncotarget 2015). The NF2 protein negatively regulates various signaling pathways including mTORC1 and mTORC2, and meningiomas and schwannomas with NF2 loss display abnormal activation of these pathways. 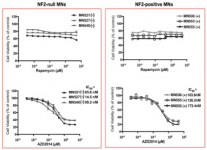 Rapamycin is a selective inhibitor of mTORC1, and AZD2014 is a dual inhibitor that blocks mTORC1 and mTORC2 (Fig. 1). 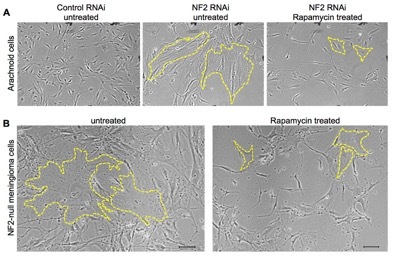 Our in vitro studies showing aberrant activation of mTORC1 signaling and treatment of NF2-null meningioma cells with mTORC1 inhibitor rapamycin led to clinical trials for NF2 patients (Fig. 2). Furthermore, our more recent studies using dual mTORC1/mTORC2 inhibitor AZD2014 establish that inhibition of both mTORC1 and mTORC2 is more effective (Fig.3) (Beauchamp, 2015). This work is leading to clinical trials for NF2-related and sporadic meningiomas in collaboration with Dr. Scott Plotkin at MGH. Our current projects focus on the mechanistic aspects of mTOR signaling activation upon NF2 loss, identification of other kinases and pathway targets in NF2-deficent human cells and addressing the crosstalk among various pathways dysregulated in NF2-associated tumor cells. Tuberous sclerosis complex (TSC) is a multisystem genetic syndrome caused by mutations in TSC1 or TSC2, with increased prevalence of epileptic seizures, autism spectrum disorders (ASD) and intellectual disability (ID). Analyses of brain pathophysiology in TSC can lead to a better understanding of this neurodevelopmental disorder and provide clues for the shared molecular mechanisms between TSC and related ASD and ID. Although successful studies in animal models and cellular models of TSC have led to clinical trials with rapamycin analogs targeting mTORC1, progress toward fully comprehending TSC pathophysiology, along with development of more effective disease-modifying therapeutics, has been hampered by challenges in establishing disease-relevant human cell models to support cell-dependent studies and drug screens. 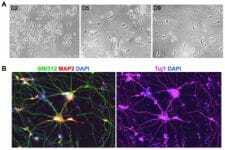 To overcome these limitations, we take advantage of recent advances in reprogramming of somatic cells into induced pluripotent stem cells (iPSCs) and in genome editing technologies that provide a powerful strategy to establish isogenic, TSC patient-specific iPSCs that differ exclusively at the disease-causing genetic alteration. Such isogenic iPSCs can be differentiated into CNS neural progenitor cells (NPCs) and neurons (Fig. 4) as well as other non-CNS cell types, thereby providing novel avenues to investigate the pathological basis of TSC and discover new treatment targets.